What a beautiful sea of yellow! That was my thought, recently, as I looked out across my dandelion-speckled lawn. I confess, that’s not how I’ve always felt in the early spring days of the dandelions’ full bloom. In fact, I’ve spent more than one spring feeling disdain for the prolific nature of Taraxacum officinale. I love the beauty of a nicely manicured, green lawn as much as the next person, but in recent years, I’ve come to look kindly upon the lowly dandelion “weed” as nature’s beautiful gift to us. 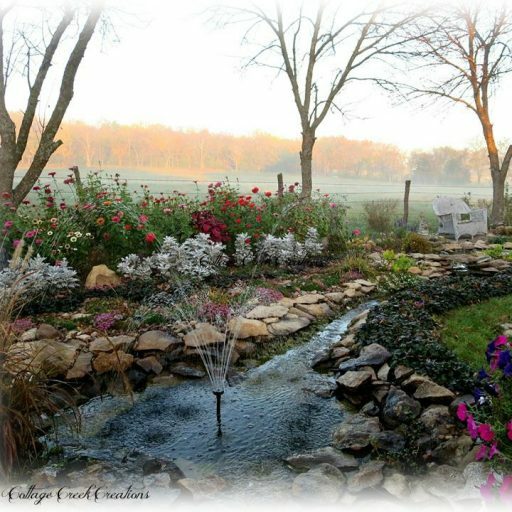 My change of heart started, one spring day, when my three year old grand daughter ran excitedly toward a stand of fuzzy topped dandelions, squealing, “Look, Nana! Diamond rings!” Her pure delight in the discovery of such treasure was infectious, instantly changing my own jaded view. Long-buried memories of my own, simple, childhood pleasure was brought to the surface as her tiny feet cut through and released a million wisps into the springtime afternoon. Children are deeply intuitive, in their innocence, finding extraordinary wonder in things of the ordinary. They are able to clearly see the gift in simple things, which has been long forgotten by those whose crystal sight has become dimmed by the years. Summer after summer, she has presented me with beautiful bouquets of brilliant yellow. Each tightly clutched bunch earnestly picked and then given with heartfelt sincerity…as if it were a priceless treasure. Seeing through my granddaughter’s eyes was only the beginning of my change of heart toward dandelions. While struggling to find answers for a serious chronic illness from mold exposure, I happened across information about the incredible detoxification benefit of drinking dandelion tea. It turns out, as seen in this article from Dr. Axe, that the pesky “weed” that we try so hard to eradicate from our yards is a powerful, healing herb! The health benefits extend far beyond its detoxification properties, including helping to support bones, the liver, skin, insulin production, and a healthy urinary tract -to name only a few. 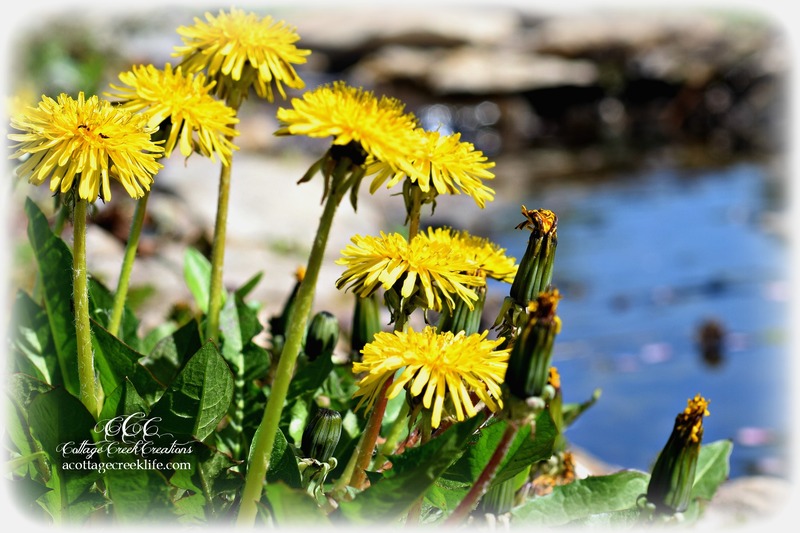 Every part of the dandelion plant is edible and beneficial. It is a power-house “medicine-chest” of a plant that is freely available to much of the world’s population. And that’s not all! There is another precious gift that dandelions give. After several years of a noticeable decline in both honey bee and bumble bee populations in my garden, I was delighted to see the yard abuzz, this spring, with honey bees happily gathering pollen and nectar from the bright yellow blooms. The world’s bee populations are seriously threatened. Neonicotinoids, found in agricultural/lawn and garden chemicals, seems to be a big player in this issue. (For more information, please see this recent, in-depth Huffington Post article.) If bees are threatened, our food supply is also ultimately threatened. It’s pretty simple to see where the end of that road will lead. During the springtime, bees are particularly dependent upon dandelions, as described by hostahoneybeehive.com. Large quantities of nectar and pollen are needed by a honey bee colony. Dandelions are what is called a “first food” for honey bees, and it can literally keep a colony from starving, as they deplete their winter stores. Poisoning dandelions not only kills that critical “first food”, it kills the bees themselves. Poisoned nectar and pollen can be carried back to the hive, thus affecting the entire colony. I find it incredibly ironic that we hold such disdain for the little plant that brings such benefit to us. A new season’s crop of dandelions has arrived. When my granddaughter presents me with the next carefully gathered bouquet, I will gratefully accept both her gift and nature’s beautiful bouquet…for the intent behind each is priceless. Children can teach us invaluable lessons. If you enjoyed this story, you might also enjoy reading Chasing Bubbles. Thank you for stopping by. Hope to see you again, real soon!